Summer’s almost here! It’s time to take the kids to all their favorite places — pools, waterparks, and water play parks, just to name a few. You already know to slather on the sunscreen, keep them well hydrated and keep a close eye on them in the water, but there’s something else you may need to add to your water safety checklist. How can you keep them safe from contaminated water? Recreational water illnesses (RWIs) are caused by exposure to water contaminated with germs or chemicals. RWIs can also be caused when chemicals in the water create unsafe air in indoor facilities. The most common RWI is diarrhea. However, RWIs also include eye, ear, skin and lung infections as well as neurologic and gastrointestinal issues. It’s not fun to think about, but RWIs are a common problem. Thankfully, there are ways to prevent them. 1. Keep pee and poop out of the pool. Yes, this one seems like a no-brainer. Everyone knows that the pool is not a bathroom, but there may be some things you’re not thinking about. For instance, swim diapers are not leak-proof. If your child poops in his swim diaper, get him out of the water immediately. Also, you should never go swimming if you have diarrhea. The germs that cause diarrhea will be easily spread to the water and infect other swimmers. Everybody’s body has dirt, sweat and — I hate to say it — residue from feces on it. Rinsing off under a shower for just one minute will get rid of all that ick before you jump in the pool. 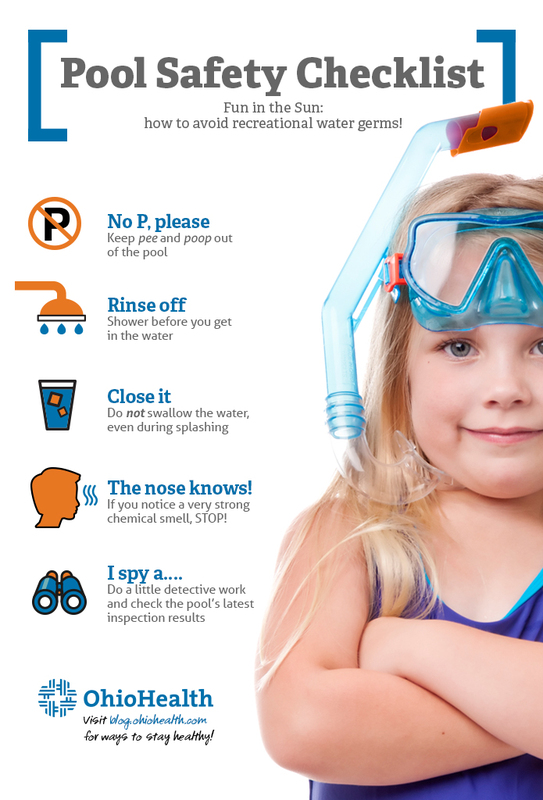 Chlorine and other pool chemicals kill a lot of germs, but they can’t do it instantaneously. It takes several minutes to kill most germs, and several days to kill the germ that most commonly causes diarrhea. When chemicals are working to clean up things like dirt and sweat, they are not able to target germs as powerfully. 3. Do not swallow the water. Swallowing even the tiniest amount of contaminated water can make you sick. Explain to your kids that this water should not be in their mouths. Even splashing water in each other’s faces or dunking one another can cause someone to swallow enough water to get sick. 4. If you notice a very strong chemical smell, STOP! You might think that a strong chlorine smell means that the pool is clean, but it’s actually the opposite. While a slight chemical smell is normal, a strong smell only occurs when chlorine mixes with pee, poop, sweat and dirt. If the smell is so strong that your eyes turn red and burn, you begin coughing, or your nose starts to run, the water is probably not clean. 5. Do a little detective work. Public pools should be managed by knowledgeable staff, but you can also do a little double-checking to make sure the water is safe. Check the pool’s latest inspection results. Make sure you can see the drain in the bottom of the deep end of a pool. If you’re feeling extra diligent, you can even use over-the-counter test strips to check PH and chlorine levels. The right balance helps ensure that the chlorine is at its most efficient germ- and bacteria-killing level.